Three stained glass windows. 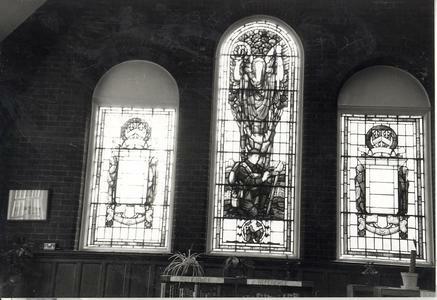 The large central window depicts winged victory bearing a symbolic torch and laurel wreath. At her feet is a kneeling soldier planting a wooden cross. In the centre of the lower part of the window there is a medallion of a seated mother reading to her child. Both side windows show a classical stone tablet surmounted by the school crest with draped grieving women on both sides. At the bottom of each is a swagged shield with the dates 1914-1918.